Does the theory behind the supplement in question make sense? Are there any scientific evidence supporting the claims made for the supplement? Is the supplement legal and safe to use? Answer yes to the above questions and you might be on to a winner. Research into sports nutrition is an ongoing process. And it is right that from time to time we take a good hard look at some of the findings to see how the evidence stacks up for certain nutrients. It is outside the scope of this article to do a sports nutrition review on every nutrient, but when claims are made which suggests a certain nutrient can improve athletic or competitive performance, my interest is always peeked. So, let’s take carry out a sports nutrition review on Omega-3. Currently, certain claims related to improved athletic performance are being made for fish oils containing the omega-3 fatty acids, Eicosapentaenoic acid (EPA) and Docosahexaenoic acid (DHA). For some years now the health benefits of fish oils and omega-3, in particular, have grown. I am sure many of you can remember being forcefully given cod liver oil as a child. Little did we know of the enormous benefit that disgusting liquid was providing us. While scientists seem to have established the health benefits for ingesting omega-3 oil, it hasn’t been until fairly recently that sports performance benefits were associated with the ingestion of this supplement. There is now a growing body of evidence that suggests that including omega-3 in your diet can improve certain physical functions in your body that can ultimately lead to an improvement in physical performance. Exercise is stressful to the body, and the trauma of this stress sets up an inflammatory response in our bodies. High levels of inflammation can negatively affect your body when repairing tissue and other aspects related to recovery. I am always a little sceptical about studies performed on animals oppose to humans. However, a study involving rats suggested that taking omega-3 fish oils reduce oxygen consumption, improve the endurance and helps muscles to recover faster. It would seem that supplementation of fish oils and especially omega-3 reduces the amount of inflammation in the body after exercise. Less tissue damage means that you will recover from a bout of training more quickly. Delayed-onset muscle soreness is the result of structural damage to the muscle. In its most severe form, this damage may include rupture of the cell membrane and disruption of the contractile elements of individual muscle fibres. Strenuous exercise especially when the stimulus is new to the body can cause muscle damage and can result in delayed-onset muscle soreness and loss of physical function. This type of damage appears to result in an inflammatory response. Ingesting omega-3 fats have been shown to increase blood flow to muscles during exercise and decrease muscle soreness by 35%, thereby reduce swelling, and increase range of motion after damaging exercise. Testosterone is a hormone with an anabolic effect on muscle tissues. It plays a critical role in the function of muscle gain and muscle performance. Taking part in intense resistance exercises has demonstrated an increase in the concentration level of testosterone in athletes. However, recent studies have indicated that the ingesting of fish oils could boost your testosterone levels also and as such, could, therefore, improve your physical performance. Emerging work is even showing that omega-3 may regulate muscle growth and help during extended periods of rest by slowing the loss in both muscle and bone. This could have application for athletes during breaks in training or layoffs due to injury where muscle loss could be significant. 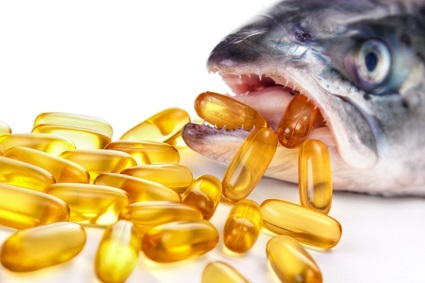 As a supplement, the labels on many omega-3 brands suggest a wide variety of dosages. This is because each brand has differing amounts of EPA and DHA, the critical ingredients of fish oils. Many of the studies of omega-3 set the amount to be taken to be between two and three grams (2000-3000mg) per day. However, you have to remember that we are talking about EPA and DHA, not just fish oil. Studies also suggest that the anti-inflammatory reaction of EPA doesn’t seem to kick in unless you consume at least 2000mg each day. So, it would seem that a minimum dosage of around 2000mg per day is a good place to begin. As you can see, these results suggest that omega-3 fish oil supplementation may represent a possible nutritional strategy for assisting exercise recovery and enhancing training adaptations, all of which could help improve your sporting performance. And from a sports nutrition review perspective, the evidence related to omega-3 seems to satify the three criteria of, making sense, having evidence which supports the theory and is legal and safe for use. From "Sports Nutrition and Physical Performance" To " Faster, Stronger, Better – Your Shortcut To Improved Athletic Performance"